One of the inspirations for the Guest Room Refresh came from a collection of vintage linens I got from my grandmother. They weren’t in great shape, though, so I’ll show you how to care for and clean vintage linens, and how to use them to dress a cute bed — and make a room extra special. Let there be light! The Guest Room is at garden level — a fancy way of saying it is basically a basement. The windows are at ground level, so I have brought in lots of light and window treatments that take advantage of the sunlight, too. We are repurposing some old furniture, making a few new pieces, and scouring the Facebook Marketplace and Craigslist for the rest. Come see everything I’ve found — and how I’m making old things new again. Where did we start with this guest room? And what are the plans? I’ll show you my inspiration board, the furniture we started with, and the guiding principles I’m using as the room evolves. 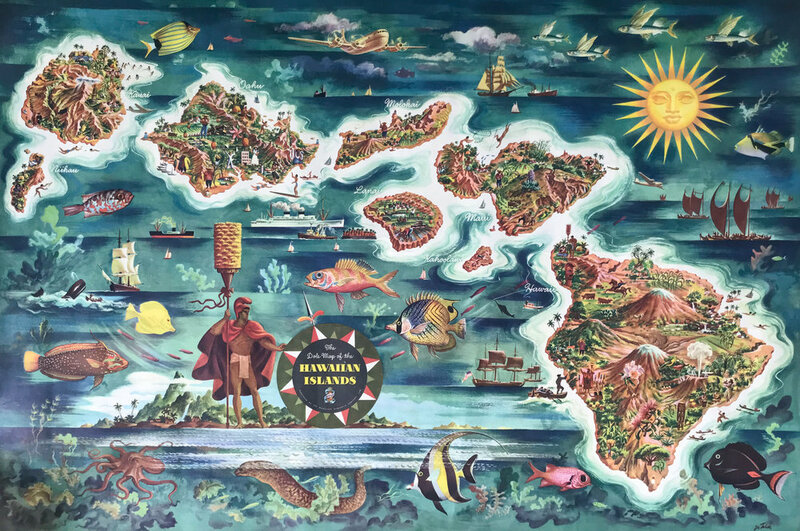 The inspiration for our Guest Room Refresh came from a vintage print of Joseph Feher’s map of the Hawaiian islands produced for the Dole Fruit Company in 1950. As it turns out this poster which we found in the attic of a previous house, has a fascinating history.